Nature photography is a particularly serendipitous art form. We do our best to get ourselves in the right place at the right time, but it’s ultimately up to Mother Nature to deliver. Fortunately, some things in nature are more certain than others. Among them is the phase, location, and timing of the moon, each of which can be anticipated with near absolute precision. Another certainty I’ve grown to depend on is clear skies in California in July. 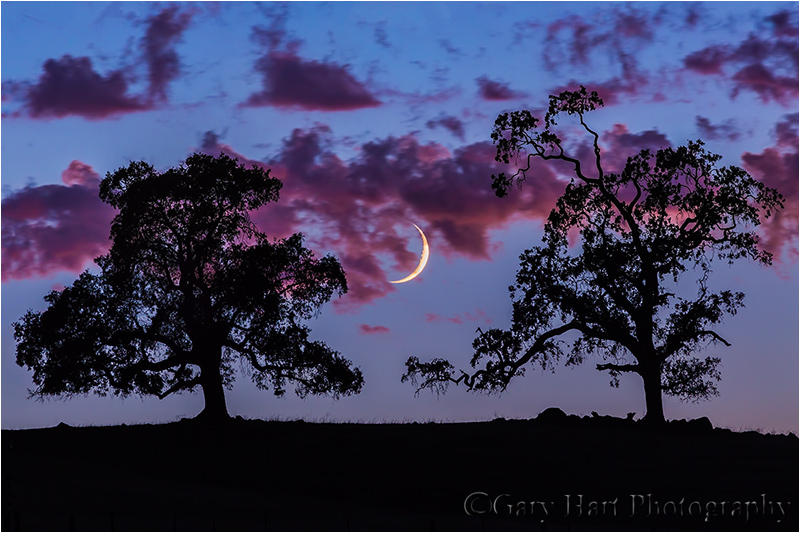 Armed with those two truths, Wednesday night a friend and I headed to the foothills to photograph a thin crescent moon in the western twilight. My criteria for photographing any twilight scene include finding a striking shape to silhouette against the sky. And like a portrait photographer who can’t get enough of a particular model, there a number of “go-to” trees scattered about the foothills that I return to whenever I get the urge to photograph a sunset near home. For a long time I’ve known the hilltop perch of one pair would allow me to juxtapose them with a setting moon. I’d already photographed this pair many times with good success (one of these images was on a magazine cover), and one time got them with a crescent moon. But that success only made me greedy for a tight shot with the moon large, among the trees. I check the moon info each month to see if its phases and position align with my schedule (for obvious reasons, I’m often away from home when the moon is at its photographic best), and Wednesday night looked like everything might just fit into place, so out we went. By about two hours before sunset it became pretty clear that clouds would be part of our sky that evening. While not unprecedented, this unexpected intrusion could be: A) Good, if the clouds added sunset color while parting enough to reveal the moon; or B) Bad, if the clouds thickened to obscure the moon and block the color. Serendipity. Mark and I pulled up to “my” trees about fifteen minutes before sunset, but with the clouds starting to look like they might deliver a colorful sunset, and since we didn’t need to be in position for the moon until 25 or 30 minutes after sunset, I made the snap decision to continue about five miles down the road to another group of trees that I thought would be particularly nice for a colorful sunset. The sunset was indeed worth the detour, but that’s a story for another day. When it was over, we hightailed it back to the hilltop tree spot to find the moon playing hide and seek with the clouds above and just a little south of the trees. Definitely photo-worthy, but not aligned so perfectly that I could get the tight telephoto shot I’d envisioned. Fortunately, none of that stuff happened, and Mark and I made it back to my car, undetected and intact. Impulsive urges notwithstanding, I ended up with several “keeper” images, thanks in no small part to the convergence of my plan with the fortuitous appearance of clouds to color our summer sky. Sometimes things just work out. Later, I had to admit that going up there like that violated one of my personal rules: Get permission before entering private property (I’ll often offer a print as thanks). But this time I rationalized that since we’d do no harm, and because time was absolutely of the essence, it would be okay to maybe go just a little bit beyond the fence. And while it worked out this time, that’s the kind of decision that inspires hindsight (and I have the stories to prove it). 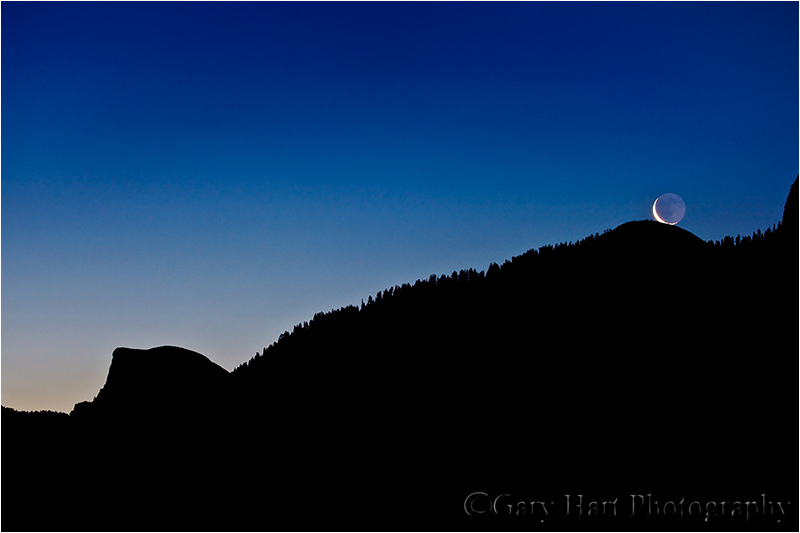 I’d billed my just completed Yosemite spring workshop as a crescent moon workshop. The plan was (among other things) to photograph a crescent moon rising above Yosemite Valley in the pre-sunrise twilight on consecutive mornings. This spring waning crescent is one of my very favorite Yosemite phenomena, something I try not to miss each May (when it aligns best with Half Dome from the most accessible locations). But Mother Nature had other ideas. Instead of the reliably clear skies California typically enjoys in May, this year a stubborn low pressure system parked off the coast and pumped moisture into Northern California. But despite a pessimistic forecast that called for rain and lots of clouds, my hardy group rallied at 4:45 each morning to be in place in the unlikely event the moon showed. For our first morning I’d plotted a location beside the Merced River to photograph a 12% crescent moon that would appear from behind Half Dome just before 5:15. 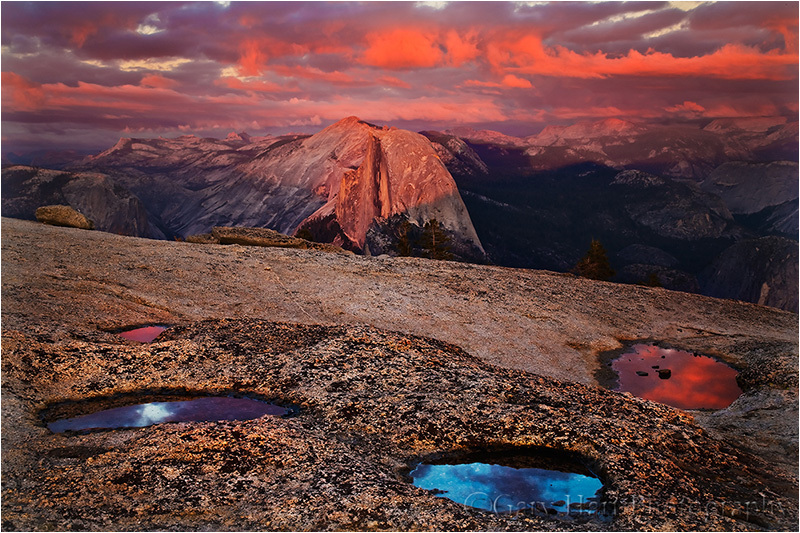 But we pulled up to the spot to find that the clouds had swallowed Half Dome; we didn’t even get out of the cars. Instead we hightailed it to Tunnel View for the first of what would become many Yosemite Valley clearing storm experiences (that most Yosemite visitors can only dream about). By the time we arrived the sky had brightened significantly, the clouds above Half Dome had started to part, and wisps of mist swirled on the valley floor beneath Bridalveil Fall. My plan for our second morning was to start at Tunnel View at around 5:00, exactly one hour before sunrise. I knew a 6% crescent moon would crest Sentinel Dome (between Half Dome and Cathedral Rocks) at 5:13 (+/- a minute or so), and wanted to give everyone enough time to set up in the dark. It was still quite dark when we arrived, with just enough light to know something special was happening in Yosemite Valley. I hustled everyone to the wall and assured them that their cameras would be able to accumulate enough light to reveal far more detail than our eyes could see. To give you an idea of how dark it was when we started shooting, the image at the top of page is a 30 second exposure at f4 and ISO 800. If the sky had been clear when I clicked this frame, the moon would have been balanced atop Sentinel Dome, almost exactly as it was in May, 2008 (below). Contrast the above clearing storm exposure settings with the settings for my crescent moon image below: 5 seconds at f7 and ISO 200. Both were almost exactly 45 minutes before sunrise, but in the crescent moon image I intentionally underexposed the scene to hold the color in the sky (washed out to my eyes by the rising sun), hide foreground detail, and etch the distinctive outline of Half Dome and Sentinel Dome in silhouette. The clearing storm image, on the other hand, is actually slightly overexposed to reveal beauty hidden by the darkness in Yosemite Valley. So if there’s a single takeaway from these two images, it’s that just as with our composition decisions, our exposure settings are creative choices allowing us to express the world in ways that are different, but no less true, than the human experience. 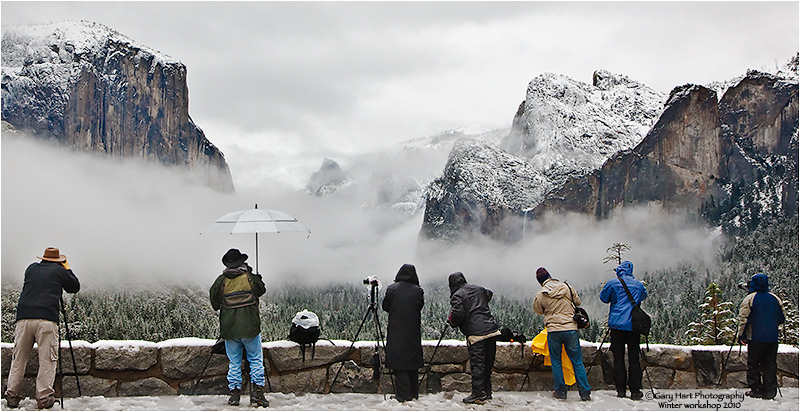 Photography is most powerful when it can expand our perception of reality to reveal unseen or overlooked aspects of nature, whether it be the simple shapes of Yosemite Valley, or the hidden world before the sun. Before the inevitable “that color isn’t natural” comments, let me strike preemptively by addressing the common misconception that color is an inherent, exclusive quality of an object or scene. While color is indeed a defining characteristic, of equal importance is the light illuminating an object or scene. Just as the sky is blue at noon and orange at sunset, every scene in nature changes color throughout the day. Color becomes a bit more problematic at night, when there isn’t light enough light for the cones in our eyes to register color. But that doesn’t mean the color isn’t there. Camera’s have many disadvantages compared to human vision, but one area where a camera excels is its ability to accumulate light. Using this capability, photographers can reveal a scene’s natural color by brightening the scene far beyond the human experience.